With everything there is out there on the subject of Design Controls, you’d expect to find more on the topic of Design Transfer. Unfortunately, there doesn’t seem to be much said on the subject. There’s just a single sentence in 21 CFR Part 820.30, and ISO 13485:2016 goes only a little further with a short paragraph. That’s not a lot to go off of. As we look more in depth at design transfer in this article, we’re going to look at when you should start the process and what it includes. 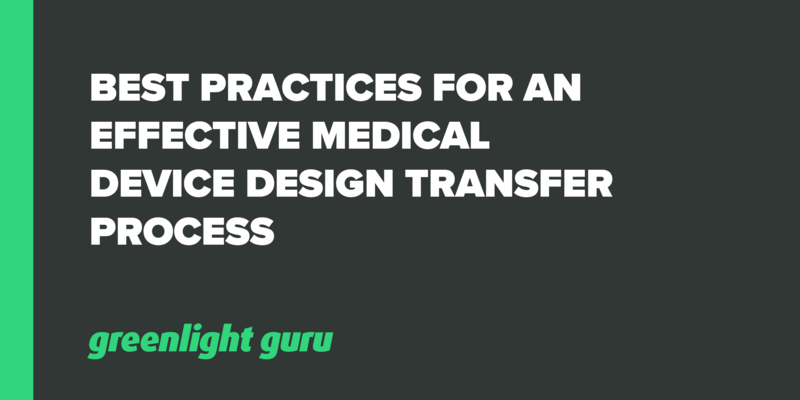 Free Resource: Download a PDF eBook version of Best Practices for Effective Medical Device Design Transfer Process. When should you start the design transfer process? As a product development team member, design transfer might sound like something you don’t need to concern yourself with. After all, that’s for manufacturing the product and you’re still working on designing and testing it. If that’s what you’re currently thinking, go back and reread the section of FDA’s design control guidance on Design Validation. It specifically says that validation shall ensure user needs are met and that it includes testing production units. Don’t wait until design validation testing to begin thinking about manufacturing. One of the biggest mistakes you can make is to think that because you made a few devices for verification testing that you’ll be able to build full scale production volumes the same way. Instead, you should be thinking about manufacturing during the design output phase. If you are thinking about how to manufacture the product AND the limitations associated with those methods, your design transfer phase will go much smoother. Let’s pause for a moment at the design output phase. If you go back to 21 CFR Part 820.30 and ISO 13485:2016, what do these both have in common with regards to design output? They both talk about production specification. Wait a second…production specification? We’ve talked all about how we need to design a device that meets the user needs and about creating design specifications, but production specifications? When do those come into play? If you read the FDA Design Controls Guidance, you’ll find production specifications come into the picture as we start talking about Design Outputs and there’s a very good reason for that. The sooner you begin thinking about transferring your product into manufacturing, the more successful you’ll be. Are you still with me so far? Good, let’s even go one step further than that. Since design validation is used to show that the design outputs meet the user needs, let’s start thinking about manufacturing when we’re starting the project. This may be even more critical if you’re going to be hiring a contact manufacturer. Don’t assume that the product development team is thinking about design for manufacturing. Another common mistake is to assume that the product development team is keeping manufacturing in mind when they design. While the engineers are thinking about how the design outputs meet the design inputs, they’re not always thinking about what it’s going to be like to manufacture the product long term. Involve different people from the manufacturing team early on in the design process. Whether it’s the manufacturing engineer or the production team leader, these people have seen the good, the bad, and the ugly of manufacturing. Let’s bring them onboard at the start of the project, not when we’re nearing the finish line. Remember, the whole goal is to successfully launch a product that you can build for years to come – not to have to redesign it as soon as you start trying to manufacture. Now, we’ve gone from design transfer happening after design validation to having manufacturing involved all the way at the start of a project. Essentially, we’re now starting design transfer at the beginning. What should you include in the design transfer? To summarize, both 21 CFR 820.30 and ISO 13485 talk about design transfer as a way to ensure device design (design outputs) are transferred into (verified as) suitable production specifications. According to the FDA guidance, production specifications include drawings and documents used to procure components, fabricate, test, inspect, install, maintain, and service the device. This should all sound vaguely familiar. If you’ve read the Ultimate Guide to Design Controls or attended the Design Control webinar, you know that the design outputs are the preliminary DMR. There’s even more if you check out 21 CFR Part 820.181. That’s where you’ll find the details on what a DMR shall include. Both the DMR and Production Specification are a compilation of drawings and documents and both relate to producing or fabricating a product. If you compare them in more details, there are very few differences. In fact, the DMR is the production specification with a little extra detail. The key thing to remember is that design transfer shouldn’t be an extra process, it’s really only a review of the team’s existing work. Let’s say you’ve successfully completed your design verification and validation testing. If you’ve started design transfer at the beginning of the project, all you have to do is review your design outputs. Not only will your design transfer be successful (and painless), but you’ll have your DMR knocked out at the same time.